September 7 marked the opening of the new MISTRE (Masters in Integration, Security, and Trust in Embedded Systems) international Masters program. In a world where smart systems (IoT, connected devices, autonomous vehicles, smart homes) are omnipresent, safety and security (in other words, digital trust) are becoming major issues. IRT Nanoelec supported the development of the new Masters program, which is taught entirely in English. 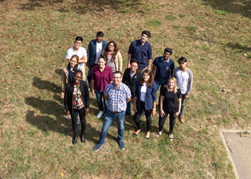 The first incoming class is made up of thirteen international students chosen from more than a hundred candidates. The program has earned the “Digital Campus” seal from the Auvergne-Rhône-Alpes regional government and is accredited by Grenoble Institute of Technology and Grenoble-Alpes University. It will bolster the existing undergraduate programs on security and trust in embedded systems.